"How Long Does It Have to Be?" Valuable to Purchasers or Users. What If I Have On-Site Users? Elicitation and Capture Should Be Illicit. A Little Is Enough, or Is It? 5: Working with User Proxies. What to Do When Working with a User Proxy. 6: Acceptance Testing User Stories. The Customer Specifies the Tests. Testing Is Part of the Process. How Many Tests Are Too Many? The Framework for Integrated Test. 7: Guidelines for Good Stories. Size the Story to the Horizon. Keep the UI Out as Long as Possible. Include User Roles in the Stories. What If We Pair Program? When Do We Want the Release? What Would You Like in It? From Story Points to Expected Duration. 11: Measuring and Monitoring Velocity. Burndown Charts During an Iteration. 12: What Stories Are Not. User Stories Aren't IEEE 830. User Stories Are Not Use Cases. User Stories Are the Right Size for Planning. User Stories Work for Iterative Development. User Stories Encourage Participatory Design. Stories Build Up Tacit Knowledge. 14: A Catalog of Story Smells. Including User Interface Detail Too Soon. Customer Won't Write and Prioritize the Stories. 15: Using Stories with Scrum. Scrum Is Iterative and Incremental. User Stories and the User Interface. Stories for a Novice Sailor. Stories for a Non-Sailing Gift Buyer. Stories for a Report Viewer. Appendix A: An Overview of Extreme Programming. Chapter 3, User Role Modeling. Chapter 5, Working with User Proxies. Chapter 6, Acceptance Testing User Stories. Chapter 7, Guidelines for Good Stories. Chapter 8, Estimating User Stories. Chapter 9, Planning a Release. Chapter 10, Planning an Iteration. Chapter 11, Measuring and Monitoring Velocity. Chapter 12, What Stories Are Not. 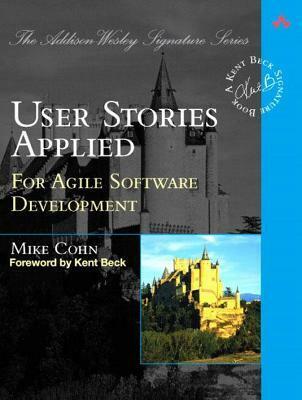 Chapter 13, Why User Stories? Chapter 14, A Catalog of Story Smells. Chapter 15, Using Stories with Scrum. Mike Cohn is the founder of Mountain Goat Software, a process and project management consultancy and training firm. With more than twenty years of experience, Mike has been a technology executive in companies ranging from start-ups to Fortune 40s, and is a founding member of the Agile Alliance. He frequently contributes to industry-related magazines and presents regularly at conferences. He is the author of User Stories Applied (Addison-Wesley, 2004).